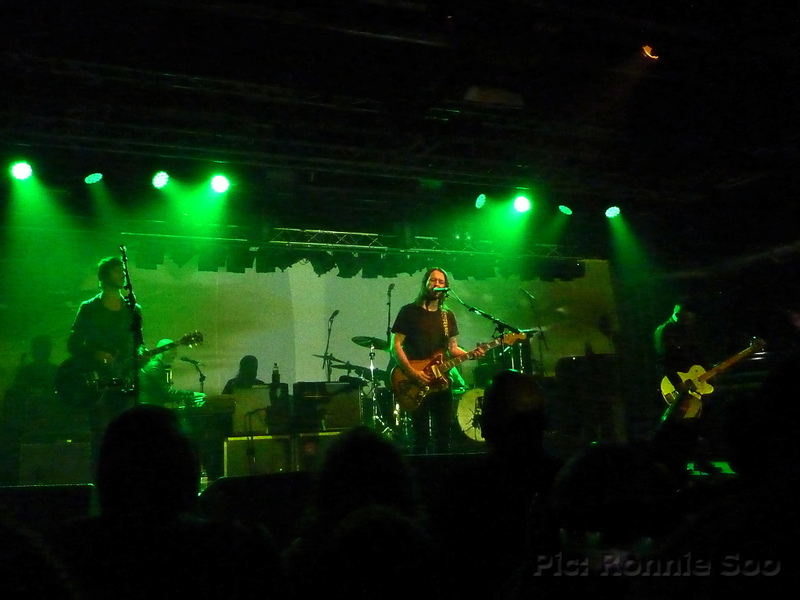 It’s been six years since Feeder last visited this city (and this venue), as frontman Grant Nicholas mentioned during this show. In the interim, after the release of ‘Generation Freakshow’ in 2013 the band went ‘on hiatus’. 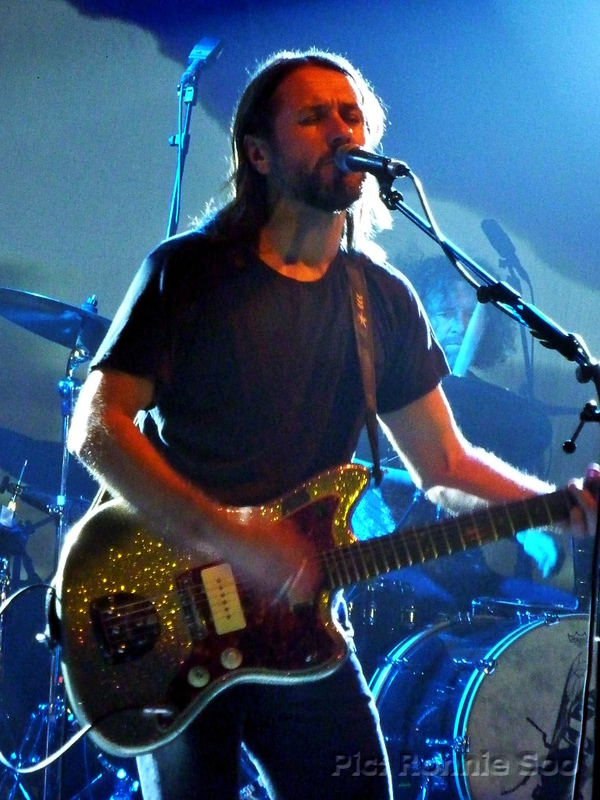 Nicholas released a solo album (‘Yorktown Heights’) in 2014 and toured it, before Feeder finally reconvened last year with the ‘All Bright Electric’ album. This run of dates is a ‘UK tour part two’; this time around they are playing several towns and cities they didn’t get to last autumn. Incredibly, for a major city often left off touring schedules, there was a competing gig across town on the same night. Local band Circa Waves were playing at the nearby Mountford Hall (a venue much-underused in my view, a topic for another day!) and had sold that place out. With that in mind, the turnout for the Feeder gig may have been affected but they still pulled around 800 (by my reckoning) to the larger upstairs hall. My work schedule at the moment means it is a little tricky to get to a gig at doors, even if it is here in Liverpool, so apologies to opener Tom Speight whose short set I missed. I was there in time to catch The Tuts, a punky powerpop all-girl trio, however. Consisting of vocalist/guitarist Nadia, bassist Harriet and drummer Beverley, they were infectious and enthusiastic and Nadia expressed her delight at being invited to support Feeder for this gig, as she cited them as childhood heroes. That made me feel my age (!) since I would have seen Feeder myself at around the time she was talking about, but she and the band were genuinely happy at performing on this stage. She mentioned an upcoming gig of their own in Manchester (which got a predictable response!) Bassist Harriet interjected that it isn’t easy to get a gig booked in Liverpool (that WlLL be a subject for a future post); I know little to nothing about what is involved in getting bands on but would like to know more about this as I’m one of the most vocal complainers about how often I find myself travelling along the M62, even when (to my eyes) there are comparable venues in my own city. Feeder pulled a surprise (to me, at least) when they came on stage: there were five of them! The band as publicised consists only of Nicholas and bassist Taka Hirose; on stage they were joined by guitarist Tom Gleeson and keyboardist Dean Deavall. The latter also contributed vocals, helping take the load off Nicholas as did Gleeson with his additional guitar. Regular touring drummer Karl Brazil (currently one of the most in-demand sticksmen) was unavailable to tour this time around and so his place was taken (at Brazil’s suggestion) by Geoff Holroyde. Opening with the slower ‘Another Day On Earth’ from the latest album, their set really kicked off when they launched into ‘Universe Of Life’ – a more characteristically lively number. The set did include several off the current record, but they made the effort to cover their back catalogue as much as possible. They even performed ‘Shatter’, a more obscure number which only appeared on album as part of a compilation (‘The Singles’). The expanded line-up worked well on stage, and I was particularly impressed with Geoff Holroyde behind the kit. He looked a little like Black Stone Cherry’s John Fred Young and hit like him too! All in all it was a more enjoyable experience than the last time I saw this band in 2011, that night I got the distinct impression they were trying to be Britain’s answer to Nirvana, but tonight was a more ‘together’ performance, and although the frontman still prefers Kurt-style Fender Jazzmaster guitars, he no longer emulates Kurt’s look. There was plenty of bouncing around in the crowd, and even Nadia and Bev from the Tuts joined in the fun towards the end (even getting themselves a shoutout from Nicholas). Naturally enough they closed the main set with hit ‘Buck Rogers’; even though the famous ‘CD player-player-player’ hook hasn’t stood the test of time (we all stream nowadays, Grant! *) it didn’t stop a mass pogo down the front. Last time I saw these I said I’d go again if they came back to Liverpool, it took a while but I’m glad I did when they eventually did return! Actually, not true in my case. I recently picked up ‘Echo Park’ on CD for the princely sum of 20p from a well-known used electronics and entertainment chainstore and yes, it went into my older car’s CD player-player-player! Same Night Syndrome. That’s the snappy name I’ve given to that irritating occurrence when two gigs or more happen on the same night. It caught me out here, when I excitedly booked for this gig having recently seen the Canadian hard rockers play a short but storming set in Liverpool as support to fellow Canucks Nickelback. I failed to spot that the date clashed with Thunder’s show at Sheffield City Hall which I’d booked weeks before, meaning a choice of one or the other. (Thunder were at Manchester o2 Apollo the night before, but that is a venue I have vowed never to set foot in ever again). Despite the fact that Thunder are a long-time favourite band of mine, I opted for this show instead and was able to find a taker for my Sheffield ticket. When your band is called Monster Truck, it’s a clear indication of what sort of music to expect. They’ve had some radio play on Planet Rock off the back of most recent release ‘Sittin’ Heavy’, and also more locally on the weekly rock show broadcast to the Merseyside area on Wirral Radio, which is how I discovered this band. Having played to arena crowds only six months earlier, it was a chance to see the band in the much more intimate confines of the Club Academy before they blow up huge themselves, as I expect. Fronted by vocalist/bassist Jon Harvey, their style is good old-fashioned, riff-heavy driving hard rock like it used to be, powered along by a solid rhythm section of Harvey and drummer Steve Kiely and given real wallop by guitarist Jeremy Widerman, whose guitar style melds the shirtless antics of Angus Young with the immense sound of Tony Iommi. Add to that tasteful organ touches from Brandon Bliss and you have a band that will take old-school metalheads like me right back to the glory days of denim and leather. Before that we had The Picturebooks; I’ve seen this German duo twice before (they supported The Answer two years ago, as they reminded punters here) and so knew what to expect. Loud overdriven guitar riffs aplenty from guitarist/vocalist Fynn Claus Grabke and hard slamming drums from Philipp Mirtschink, who hits the tom like it’s being assaulted with a sledgehammer! Their short set was pretty much relentless hammering throughout, the only changes came between songs as Fynn worked his way through a seemingly infinite selection of Gibson guitars! By the end, the drummer looked like he’d been through twelve rounds with Tony Bellew, although they didn’t bring much new to the table they did get a good reception from the crowd, many of whom had got here early enough to catch them. Monster Truck did not hang about when they hit the stage a short time later, opening proceedings with ‘Why Are You Not Rocking?’ – we certainly were, as Widerman was off on the first of many stage runs getting the crowd going from the off. Surprisingly, ‘Don’t Tell Me How To Live’ came early in the set, as they ran through a selection of tracks from both ‘Sittin’ Heavy’ and previous album ‘Furiosity’, as well as a couple from their ‘The Brown’ EP. It was just as immense as when they played the bigger stage last autumn, this band have the heaviness to satisfy the Metalheads, the rhythm to keep the heads bobbing all night and the songs to latch into the brain immediately. ‘Sweet Mountain River’ had the crowd chanting to its chorus from the off, Harvey hardly had to prompt them to chant it back loudly and enthusiastically. I opened Facebook on Sunday morning to discover a post from Y&T’s frontman and sole remaining founding member Dave Meniketti, who had yet more sad news to break. The announcement of the passing of his old bandmate, rhythm guitar player Joey Alves was the latest in a series of blows the Y&T camp have endured in recent times. With this latest loss, that leaves Meniketti as the only member of the classic line-up still with us. Alves, aged 63, had been suffering from ulceratic colitis. The news was a blow to their many fans too, myself included, especially since I (like many others) saw that classic lineup perform at Donington Park back in 1984. At that time I knew little about the band, they came on in the middle of the afternoon (actually billed higher than Motley Crue, on a bill described by many as the best line-up that festival put together) and gave a superb performance during their 40 minutes or so on the stage. They certainly left a more lasting impression on me as a young rocker that day than some of the more famous names who followed (the bill included headliners AC/DC, guests Van Halen and Ozzy Osbourne to name but three major acts). Their set was broadcast on BBC Radio One’s Friday Rock Show in the weeks following the event. At that time, they had played in the UK on several previous occasions, but unbeknownst to me that’d be the only time I’d see the classic band, indeed we wouldn’t see any incarnation of Y&T on these shores again until the early 2000s. Y&T came to prominence in the early 1980s, with their fourth album ‘Earthshaker’ (their first under the shortened ‘Y&T’ name, they’d released three previous albums under their full name of ‘Yesterday & Today’) gaining followers here in the UK as well as in their home country. They’d kicked open the door for many other (arguably lesser-talented) rock bands in the US to follow, and subsequent albums ‘Black Tiger’ and ‘Mean Streak’ kept their profile high. The band, featuring the stellar vocal and guitar talent of Dave Meniketti, had heavy armoury and melody in their locker with heavy riffs, tasty lead solos and well-written songs aplenty. Although perceived as Meniketti’s vehicle, in actual fact both Alves and bassist Phil Kennemore contributed significantly to the songwriting. The group really took off in the mid 1980s, a live album (‘Open Fire’ featuring one studio track) launched them into the same sort of circles as the likes of Crue and Quiet Riot, both bands who’d followed the trail set for them by Y&T. That studio track, ‘Summertime Girls’ was a hit both sides of the pond, but the group from then on started to pursue a more commercial direction with 1985’s ‘Down For The Count’ showing a more radio-friendly side to their music. By 1987 they’d changed labels, moving from A&M to Geffen and releasing the even more commercially-orientated ‘Contagious’. Drummer Leonard Haze had by then parted company with the band as they glammed up their look, and went after the same market occupied by the likes of Bon Jovi and Van Halen by aping both bands’ styles. Alves stuck around until 1989 before also jumping ship, and it was a new-look Y&T who released ‘Ten’ with new guitarist Stef Burns. The writing was on the wall however, and in 1991 the group disbanded, reconvening later in the decade with two low-key releases. Meniketti and Kennemore continued with Y&T until the latter’s passing in 2010, while Haze returned briefly in the early 2000s. The Y&T of today is a touring entity; they haven’t released an album of new material since 2010’s ‘Facemelter’ but play every year in both the US and Europe, and both Alves and Haze have appeared with the band on selected occasions. Sadly that won’t happen again, as the classic ‘Earthshaker’ line-up has now all gone, save for Meniketti. Joey Alves was hailed by his colleague as one of the great rhythm guitar players in hard rock, likening him to Malcolm Young no less. Meniketti, in his statement quoted fellow guitar legend Ronnie Montrose as saying: “There are rhythm players, then there’s Joey. A class of his own”. Certainly his style, preferring heavier strings for a chunkier rhythm sound allowing Meniketti to put the finishing touches on top, was hugely important to the band’s sound. The band are currently finishing their documentary ‘On With The Show’, which will feature an interview with Alves. Y&T as they are currently will be back in the UK in October/November for their annual autumn tour; last year’s tour was tinged with sadness with the loss of Leonard Haze just before it took place, and also of long-time soundman Tom Size during the tour. This year’s will no doubt have a similar feel, but many fans will be there to celebrate the former members as the present-day Y&T perform many of their old favourites once more. The gigs are coming thick and fast this month, it is almost as busy a time as autumn tends to be in this country. Third gig already in March for me and it sees a triple bill head into Liverpool, headlined by Sweden’s Bonafide. I’ll confess I knew little to nothing of this band until recently, when a track of theirs was played on the Sunday night rock show on a local radio station airing in the Merseyside region. Even in this time of social media, there’s a lot to be said for a bit of good old-fashioned radio airplay and when I found that this band were coming to Liverpool, I decided to go along. I since learned that they had performed at Hard Rock Hell last winter and reportedly went down very well; celebrating their tenth year as a band in 2017 Bonafide are supporting their latest album ‘Flames’ with this tour, taking in quite a few British towns and cities. The other bands on the bill were openers and fellow Swedes Killer Bee, and Aussie all-girl trio Tequila Mockingbyrd. Killer Bee came on early, to only a couple of people on the barrier (one of whom was your correspondent! ), the bar staff and a handful of die-hards. Giving a short set of Saxon-flavoured Metal, they gave a good account of themselves and performed with commendable enthusiasm, considering they have probably rehearsed to more people than were here at that time! Next band up did draw a few more people to the floor, as the girls (grrrls?) of Tequila Mockingbyrd took to the stage. Singer/guitarist Estelle informed us early on that their regular bassist Jess was unable to take her place on this tour, before introducing us to stand-in four stringer Keira. The stunningly attractive Keira had only learned the set in around two days, yet sounded like she had been part of this band all along. The band were a hard-hitting, hard rocking power trio with emphasis on ‘power’ – lots of meaty guitar riffs from Estelle, slamming drums from Josie and nifty fills from Keira. They reminded me somewhat of fellow all-girl trio iDestroy, perhaps a lazy comparison but they are similarly uncompromising in their approach. The girls drew a crowd at the merch table immediately afterwards, as drummer Josie told us that they’d sold all their initial stocks of their CD album ‘Fight and Flight’ but that her brother was driving up all the way from Buckinghamshire (?!) just to bring further supplies. He must have been lucky on the M6 heading North, as there were CDs available at the stand and I bagged myself one just as Bonafide hit the stage. Although more people had arrived by this time, there was still plenty of room in the venue as I headed straight back to the barrier to see these guys go through their paces. Their influences are clear for all to see (and hear); frontman Pontus Snibb wields a Gibson SG with menace, while fellow guitarist Anders Rosell might wear a Francis Rossi-approved waistcoat, and play a Telecaster but is a solid, dependable rhythm guitarist. The rhythm section of this band was its strength I thought, I found myself thumping the barrier in time with drummer Niklas Matsson and even when Snibb took a lead guitar solo, the head was still bobbing along to the relentless rhythms. They played a selection of songs from their back catalogue as well as some from ‘Flames’, as stated I am not familiar with their songs, but am definitely familiar with their style – it was a fine display of old-school hard rock, not showy, not trying to push any one member to the fore, just a hard-driving unit. The gig, coming on a Monday night, was far from packed out (for three obscure bands, they probably did well to get anybody along considering the tour wasn’t that well publicised) but those that came enjoyed a great night of rock and I for one intend to look out for any of these bands when they come around again. As a side note, stand-in Tequila Mockingbyrd bassist Keira’s regular gig is with Syteria, and they are scheduled to play in Chester in early April. Time and money permitting, I will go along. Tonight was about putting right a decades-old wrong; way back in 1990 this band (then riding high with their ‘Slam’ album) called at Liverpool’s Royal Court Theatre and… I passed on the gig! At that time the Network’s brand of funk-infused rock did not appeal to me at all, preferring as I did a heavier style of Metal I couldn’t see what it was about this band that appealed to rock fans. The gig of course was a roaring success despite my objections (!) as just about every other rock fan in the local area turned out. Not long after that, mainman Dan Reed inexplicably decided to cut off ALL his long dark hair, and after one more album (‘The Heat’, 1991) the group disappeared off the face of the earth as the grunge revolution took hold. I’d heard all about that show in Liverpool from friends who were there, and they told me that live, the band were far rockier than their records suggested. I remained unconvinced, but in 2010 after many years away from the stage, Dan Reed made a comeback. A one-off reunion of the Network led to further performances, and he also embarked on an acoustic tour alongside Tyketto singer Danny Vaughn. I saw that show in Liverpool, and although I knew all about Vaughn, it was Reed who really made an impression. Engaging, amusing and still in possession of a fine voice, he finally won me over. I’d planned to see him with the Network at last a couple of years ago, but a date clash put paid to that idea. This time around, I took the opportunity to see the band (with a new album ‘Fight Another Day’, their first in 25 years) at long last. No sooner had I entered the main hall at Chester’s Live Rooms than support Vega hit the stage. Their brand of 80s-style melodic hard rock was well delivered, and they looked and sounded exactly as I’d envisaged (singer with nicely-coiffured blonde hair, nimble-fingered guitarist with a spiky cropped hairdo and plenty of tattoos, and a big bloke on drums who had ‘Steve Harris Syndrome’ – mouthing the words to each song along with the singer!) but for whatever reason, they just didn’t excite me at all. Plenty around me were more enthusiastic, as frontman Nick Workman encouraged (and got) plenty of hands clapping and chants back from the crowd. One thing I will praise him for is his multi-tasking abilities; he called for a towel to deal with a spilt liquid on the stage (beer, presumably!) and when it eventually arrived, he threw the towel to the floor and continued to sing while mopping up the spill with his right foot! A good live band that I’d watch again if they were to appear on another bill like this, but not one I’d travel far to see. Midway through the set, the band gave up the stage for their keyboardist Rob Daiker; leaving him to perform a song of his own from a solo CD he had available at the stand. Not many frontmen would do something like that, as Daiker came out from behind his keyboards, picking up a guitar to play his song – solo at first, then accompanied by guitarist Brion James and eventually, the entire band. A remarkable gesture, but the frontman was happy to hand the mic over to both guitarst and bassist as well during this show. This was a very good performance, made all the more ‘human’ by improvising the set and with a lot of humorous interaction between the players. The younger version of me would have definitely scoffed at the thought that one day I’d go and see this funky outfit but, what did he know anyway! When they come around again (‘we’ll see you next year’ said the frontman as they signed off), be sure to go along. Less than a decade ago, a young band from Northern Ireland called The Answer were performing at the Manchester Arena as openers for AC/DC. Tonight, while the huge arena played host to the Kaiser Chiefs, less than half a mile away The Answer were in the rather more intimate surroundings of the Band On The Wall, essentially a pub with a back room professionally kitted out to host live music. It’s long been a mystery to me why this band is not now headlining the sort of large-scale venue they’ve played as support to some of rock’s biggest names, including Alter Bridge, Whitesnake and the aforementioned AC/DC. It isn’t for lack of trying, they’ve released six albums in the space of ten years and played anywhere and everywhere in that time. Their most recent album ‘Solas’, released last autumn, was a departure from the traditional hard rock they’ve become known for, introducing instrumentation often heard in Irish folk music including bouzoki and mandolin, with songs that reflected their heritage more overtly than before. The new sound has been both praised and panned, with some of their dedicated fan base embracing the change while others, perhaps taken by surprise at the abrupt musical about-turn from the five previous albums, have been less welcoming to it. The album was however critically acclaimed, and as with their previous work ‘Solas’ dented the UK album charts, while making a bigger splash in the independent and rock album charts. This venue was extremely small and intimate, with a stage only slightly raised from floor level. The stage itself was pretty cramped, so openers Black Cat Bones had their drum kit set up over on stage right. The five-piece hailing from Liverpool gave a short but enjoyable set of bluesy hard rock, vocalist Jonnie Hodson looking uncannily like 1980s-era W. Axl Rose but with a much less harsh vocal style. The band clearly do take cues from the Gunners, as drummer Ash Janes was resplendent in a G ‘n’ R t-shirt for this set. Although they’re from my part of the world, this was the first time I’d seen them, it won’t be the last. The Answer were greeted like heroes when they hit the stage, opening with the title track from ‘Solas’, it was noticeable from the off how conspicuous by its absence the restraint showed throughout that record was when these songs were played live. They were able to play for longer this time than was the case on the Dead Daisies/The Answer co-headlining tour last autumn, and so several older tracks from across their back catalogue were put back into the set alongside eight of the eleven tracks from ‘Solas’. For all that, upcoming single ‘In This Land’ (performed on mandolin with bassist Micky Waters taking up an acoustic guitar) was enthusiastically received when it was played mid-set, according to the frontman it was deliberately scheduled for release on St. Patrick’s Day as “nobody will be doing much that day in Ireland”! For those wavering about going to see this band because of the new album’s direction, don’t! They’re still the same four guys and they rock just as much as they always have – even their new material, with unusual instrumentation on record, is still delivered live by a four-piece rock band. I took the opportunity to chat with the band members afterwards (they usually come to the merch stand and mingle); Paul Mahon reckoned that they have been able to better develop the live renditions since the autumn, and Cormac said to me that I was not the first to tell him that I was better able to make sense of this album after having seen them play the songs live! In conclusion, if you liked The Answer as a live act before ‘Solas’, you still will like them live now.